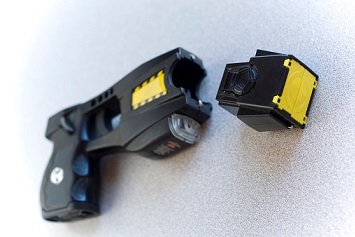 Taser or “Taser-style” conducted electrical weapons (CEWs) are popular among law enforcement officers as a nonlethal method to control an individual who poses a threat to others. While a large number of police officers carry these devices, private security firms have lagged behind in deploying them. It could be that security firms’ clients are reluctant due to a simple lack of understanding or possibly any potential legal or insurance liability issues that may arise at their facilities. The latter point is underscored by a recent incident in Philadelphia, where a man’s clothing was set on fire by the discharge of a CEW. A bystander captured the early morning incident on video, outside of Jim’s Steaks, a cheesesteak restaurant on South Street. The video shows two private security guards trying to bring a man to the ground. When he breaks free from the one guard, the other fires a CEW, which appears to attach to his pants. Upon discharge, the man’s pants erupt into flames, though he’s able to quickly extinguish the fire. The altercation was also captured on the restaurant’s security cameras, and Ken Silver, the president of the restaurant, told the Philadelphia Inquirer that “we are currently reviewing the after-store-hours incident” and that “we are [cooperating] and will continue to cooperate fully with the Philadelphia police department as needed.” There are no details about who the security guards were working for. Tom McKay at Gizmodo did a little investigating, and not surprisingly, CEW-caused fires are fairly uncommon. However, the likelihood of fire increases dramatically depending on the situation. McKay points to a 2001 report from the U.K.’s Home Office that highlighted the fire risk posed by CEWs when in the presence of a flammable substance. While this is not a surprising discovery by itself, the report shows that CEWs can ignite CS gas, an ingredient in other nonlethal control methods such as tear gas and aerosol sprays that are used by law enforcement or security guards. If a security officer fires a CEW at an individual who was previously sprayed with or has some other flammable substance such as gasoline on his or her clothes, there is a significant risk of fire. If you or your security staff carry, or are thinking of carrying, a CEW, it’s best to reach out to the manufacturer for training on the device. For example, Axon offers basic and advanced training courses directed at licensed security companies.